Location = 30km before Depot B. What a difference a day makes! What a way to celebrate the summer / winter solstice. An unusual easterly wind combined with a freshly groomed road just delivered us an early Christmas and may well have cut 10 days off the journey? We started kiting across country for 36km on a slight upwind tack. There were some challenging sastrugi patches but we powered through them at pace, with good visibly. We made it to our day’s target, depot B by the road in around 4 hours with tired right legs from holding one tack into wind the whole way. Clearly another fuel convoy has been through recently, as the road looked like freshly groomed ski resort piste. The wind was coming almost perpendicular at 15knots, perfect for our heading. We almost daren’t say anything, as it was too good to be true. 120km to the next depot. With bated breath we launched and began kiting along the road. Fully powered, we were soon covering 25km an hour across the freezing desert on a soft, smooth surface. Totally surreal to be moving like that; watching your friends leaning hard against their kites, almost flying for great distance with a heavy, but obedient pulk rocketing along behind. We saw a storm ahead, and without pause, shot into the strong winds and flat light confident in the surface and navigation and keen to seize every hour of high speed travel. We could just about see each other; the wind was pushing 28knots riding our 12m kites, but our slight into wind tack kept us in the controlled, if super over powered, zone. It was beyond words and we covered 90km down the road in 5 hours. Eventually our right knees started to give way, having held the same edge for 9 hours, and we decided to call it before somebody blew something. 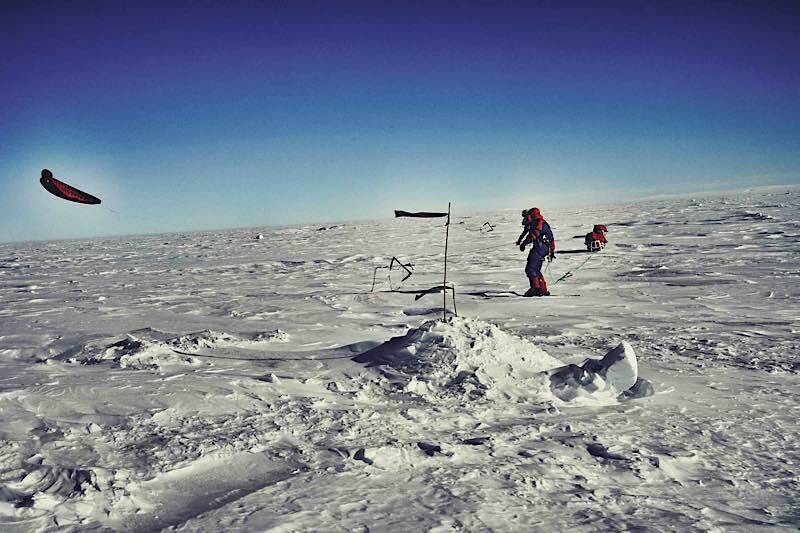 We are 30km from depot A, the end of the ‘man-haul’ leg of the expedition. It seems surreal that just yesterday morning we were potentially facing 2 gruelling weeks of man-hauling to reach depot A. We do have another 30km to go, which could be 2 days of walking in bad conditions or a mellow morning with the forecast wind? So perhaps tomorrow we begin the fourth and final stage of our expedition, the 1100km downwind kite journey back to Union glacier. The catch with today’s glory is of course that the next leg relies upon the common Southerly trade winds and will be impossible with the current wind pattern. So we will collect our Christmas supplies from depot A and celebrate in a few days like everybody else. Hopefully the Southerly will be back sooner or later? Le vent tourne et dans le bon sens, super content pour vous. Hot here today again so we just had to have a couple of swims!! Fantastic news, kiting the sort of distance that you’d hoped for. mais la route est encore longue,…..
Too easy!. This doesn’t sound very British. Just listened to F, C and J (kids always first, then women) on BabyC. Please, cut some lines, loose one boot each and let all the kites fly away but one to make it ultraepictv. Or just better come back safe before the Three Wise Men visit. Sounds like a brill day lads, glad you had some good wind. We had a good tail wind on our flight to Malaga, instead of a 3 1/2 hr flight we got there in 3hrs and 5min. So after a nice drive down the costa del sol coast road we arrived in Gibraltar and checked into our hotel. Excellent News ! Well Done ! Make the most of the rest time , hopefully a short day 2moro to the depot A t, then celebration’s !!!! Great ! Whoop, whoop. What an amazing day.